The Franklin County Conservation District provides technical assistance, financial assistance and educational services related to the conservation of our natural resources to the public free of charge, thanks to our county and state operating funds. As a grassroots, locally lead organization we are dedicated to getting conservation on the ground; conservation that benefits all Kansans by providing cleaner water, more productive soils. We are the local source for cost share funding for the installation of best management practices. We administer multiple cost share assistance programs which provide economic and environmental benefits direct to Franklin County and all residents. Even when local cost share funds have been exhausted we continue to work with our partner agencies to secure additional dollars to allow for the continued installation of additional best management practice for the benefit of the local environment. The financial assistance programs (cost share and incentive based payments) are not loan programs. These programs utilize funds designated to assist with water quality, water quantity, soil health, soil productivity, wildlife habitat, and air quality. Assistance through all programs is available to both rural and urban residents. Implementation of the state funded programs is the responsibility of the conservation district board and staff; there is no other organization who can provide this service. Thanks to our administration of three state funded cost share programs, Franklin County landowners received incentive payments totaling $37,308.25 and cost share assistance payments totaling $234,014.83 between 2013 and 2017. The total value of all conservation work associated with these payments was $367,000.90. An additional $830,362.79 was paid direct to Franklin County landowner through two federal conservation programs which the Franklin County Conservation District plays an active role in administering. This $830,000 represents approximately 50% of the actual value of work completed and implemented on the ground between the same years of 2013 & 2017. To total all of those figures; Franklin County landowners received $1,101,631.33 in payments for conservation work valued at approximately $2,027,000.00 thanks to cost share assistance programs administrated and promoted direct by the Franklin County Conservation District. These figures do not reflect any payments made through the Conservation Reserve Program (CRP) which the conservation district also provides assistance in implementation of. ﻿The Kansas Department of Agriculture, Division of Conservation (DOC) administers four voluntary cost-share programs, the Water Resources Cost-Share Program (WRCS), the Non-Point Source Pollution Control Program (NPS), Riparian and Wetland Protection Program and the Kansas Water Quality Buffer Initiative Program. These programs provide financial assistance to eligible landowners for conservation practices that reduce soil erosion, improve water quality and/or conserve water. The Franklin County Conservation District actively implements the WRCS, NPS and Buffer Programs under the guidelines set forth by the DOC. A list of eligible conservation practices available for funding through the Kansas Cost-Share Programs in Franklin County is available at the bottom of this page. Click on the "CostsharePractices.pdf" file below to view the list. For more information on the Kansas Water Quality Buffer Initiative Program please contact our office due to the current Federal "freeze" on CRP. Funding provided by the Division of Conservation, Kansas Department of Agriculture through appropriation from the Kansas Water Plan Funds. If records indicate you have a debt owed to the state of Kansas, a Kansas municipality or a District Court, the debt must be paid in accordance with K.S.A. 75-6201 et seq. The amount owed may be deducted from the earned cost-share amount by the Accounts Receivable Setoff Program administered by the State of Kansas Department of Administration, Division of Accounts and Reports. > Applications received in January and February will be grouped and ranked first for possible funding on July 1. > Applications received March 1 through June 30 will be grouped and ranked for possible funding on August 1 if funds remain available from July 1 allocation. > Applications received July 1 through November 30 will be grouped monthly and ranked for possible funding monthly beginning September 1 if funds remain available from July 1 allocation. > Applications will not be accepted in December. All unfunded applications on file from January 1 through November 30 of current year will be notified in December of the new year applications process which begins again in January. Unfunded applications are encouraged to apply in January and February for great chance of receiving funds. Pasture related projects must also complete the benchmark assessment worksheet which is part of the SFY20_Application file. Technical assistance for planning, design, construction inspections for all cost share projects is provided through our office; landowners are not required to contract with private engineers for these services. A list of local contractors is provided on our "Services" page. Landowners may contract with any contractor of their choice, the list is provided only as a service, no endorsement or recommendation is given to any one contractor. Additional funding for the installation of best management practices (BMPs) within certain high priority areas of Franklin County is anticipated to be available beginning July 1, 2019. As part of the Watershed Restoration and Protections Strategy, or WRAPS, watershed assessments to study water quality were completed on watersheds across the state. The Marais des Cygnes watershed is one of many watershed to have a completed assessment plan that outlines resource concerns directly related to watershed health. There are many sub-watersheds within the MdC basin with water quality impairments that are considered high priority areas, and therefore will be eligible for additional funding for BMP payments. Specific impairments to be targeted include dissolved oxygen in Pottawatomie Creek in southeast Franklin County; and bacteria in the Marais des Cygnes River, and drainage into the MdC, in central Franklin County. Eligible BMPs to be implemented may include vegetative filter strips; relocation of feeding pens; relocation of pasture feeding sites; off stream watering systems; implementation of rotational grazing; riparian area protection fence; terraces and grass waterways; vegetative and riparian buffers; grade stabilization structures; and nutrient management plans/soil testing. 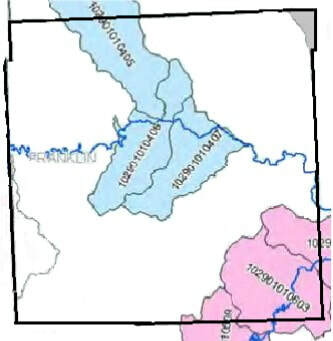 The Hillsdale watershed also has a completed watershed assessment and is offering similar BMP and incentive payments within Hillsdale watershed. There may also be incentive payments for implementation of no-till practices and use of cover crops within priority areas in the Hillsdale watershed. The three priority areas are shown in blue, pink and gray on the map above. Landowners within any of these priority area who have resource concerns related to soil health and water quality on their land are encouraged to contact the Conservation District beginning January 2 for possible cost share and incentive payments to be available mid year 2019. For up to date information landowners are encouraged to follow our Facebook page “Franklin County Conservation District” and also the “Hillsdale Watershed” page for specifics within the Hillsdale watershed. Landowners with current farm/tract numbers on file with Farm Service Agency may submit up to TEN soil tests on agriculture production land (pasture and/or row crop) through this program. Homeowners may submit up to TWO soil tests from lawn and or garden areas through this program. No more then TEN TOTAL tests are allowed for anyone landowner. $8.60 will be paid on each soil test through the NonPoint Source Pollution Control Program, administered exclusively through the Franklin County Conservation District. > Balance due per test is the responsibility of the landowner and must be paid at the Franklin County Extension Office. Funds from the NonPoint Source Pollution Control Program are awarded through the Kansas Water Plan. These funds are provided to improve and protect water quality. Compliance with KSU Soils Laboratory and KSU Research & Extension agriculture agent recommendations is required. Fertilizer cannot exceed 10% of the recommended amounts to maintain future program eligibility. Participants must agree to follow the recommendations received from the Franklin County Extension Office for applying nutrients. Soil samples must be collected following proper sample collection techniques as directed by KSU Soils Laboratory; and must have been collected from within Franklin County. FREE soil tests are no longer available due to shortages in state funds. The purpose of the Franklin County Conservation District's On-site Waste Water System (OSW) repair program is to upgrade failing on-site waste water systems (Lagoon/Septic Tanks) to help improve water quality. The OSW program is a component of the NPS program administered by the Kansas Department of Agriculture; Division of Conservation. Application dates and other procedures as described above for the NPS Program apply to the OSW program, in addition to the following. well AND at least one of the following (1A-1D) are present at the site. 1A) Current system is a rat hole, cesspool or seepage pit. 1B) Current system is within 100 ft of domestic well. 1C) Current system is up gradient from the domestic well and is within 400 ft of the well. failing system is determined by the local sanitarian to be a possible source of the contamination. map; on site measurement may be completed by County Sanitarian to determine locations close to the 500 foot distance. 3. Failing system is located within a two-mile radius of a public water supply well. To improve restore, manage, and conserve habitat for Monarch Butterflies on agricultural and tribal lands, USDA’s Natural Resources Conservation Service (NRCS), National Fish and Wildlife Foundation, the Kansas Association of Conservation District (KACD) and other partners have joined in a Regional Conservation Partnership Program (RCPP) to offer financial assistance to help agricultural producers increase milkweed and nectoring plants on agricultural land to improve habitat needs for Monarch Butterflies. This conservation partnership, which will rely on local county conservation districts to assist with outreach and education about RCPP and the benefits of monarchs and all pollinators will provide $182,000 in financial assistance to landowners throughout Kansas. NRCS is providing funding through the Environmental Quality Incentives Program (EQIP). Interested landowners may submit an application at any time at their local USDA Service Center. Applications are available at the USDA Service Center at 343 West 23rd Street, Suite 2, Ottawa KS. Office hours are 8AM – 4:30PM Monday through Friday. The Franklin County Conservation District, located in the USDA Service Center, will be able to offer for sale approved monarch seed mixes to be used for approved RCPP contracts. Targeted areas where EQIP funds will be available for agricultural producers interested in implementing conservation practices include all counties in Kansas. Funding will go toward conservation improvement practices such as milkweed plantings, pollinator plantings, brush management, prescribed grazing, as well others. For more information, go to the Kansas NRCS Web site www.ks.nrcs.usda.gov/programs or visit your local U.S. Department of Agriculture (USDA) Service Center (343 West 23rd Street, Ottawa KS). To find other service center locations, go to offices.usda.gov. USDA is an equal opportunity provider, employer, and lender. Federal Farm Bill Conservation Programs.